Layering is a must during pregnancy. Hot one minute, freezing the next! This cardigan will get you through in style and it can be carried over to your non-maternity wardrobe too! It has a long, lean fit-boyfriend style with buttons along the left hand edge. 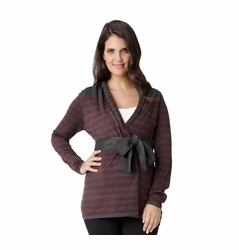 The Manor wrap is a knit maternity cardigan with an attached tie. This amazing layering piece features a wrap front, empire tie and long sleeves. A great item for your maternity wardrobe that looks fantastic with fitted tops and any of our maternity pants. The Classic Tailored Suit Jacket is high quality career piece that matches perfectly with the Perfect Fitted Pants or Above the Knee Pencil Maternity Skirt to create the ideal professional maternity business ensemble. Single button allows for tummy growth throughout pregnancy. Details include faux breast and hip pockets, full interior lining, lightly padded shoulders and decorative back waist button tab. For a different look, wear with a career dress or roll up the sleeves and wear with your favorite maternity jeans. Slightly oversized boyfriend shape makes this knit so easy to wear. Throw it on and you're ready for the weekend! A must for your fall/winter maternity wardrobe. This sweater will also work post pregnancy, so you will enjoy it for years to come! 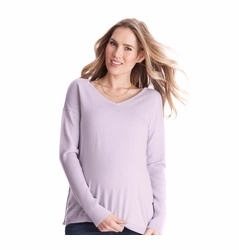 Fashionable and functional maternity outerwear to complete your look and keep you warm. Non maternity outerwear may not be roomy enough to cover your bump and can look frumpy instead of fabulous. Our specially selected designer pieces will provide the coverage you need and the style you deserve! Best of all, most will work right into your non maternity wardrobe and provide you with years of fashionable layering pieces, pregnant or not! Whether you are searching for a summer weight cardigan, a heavy wool coat or a casual maternity sweatshirt or poncho, we have plenty of choices to fit your style. We proudly offer designer maternity brands like Olian, Maternal America, Maternite, Lilac, Seraphine, Ripe, Everly Grey and Nom.